Mother's Day is so close to when we'll be having our new baby this year. Kinda like that one I got you for Father's Day that year. I'm not sayin' anything, I'm just saying its pretty, that's all. No, Anna Maria, you THINK you have it linked there. :-) The link is the Christmas tree with glittery birds on it. hhhhhmmmmmm....notes of suggestion to the husband on the blog....great idea! so are you due with a boy? hmmmmmm? What a wonderful idea! My husband reads my blog, perfect place to leave a note of suggestion. The print is lovely, by the way. Reminds me of the poem I would recite with my little ones when they were...well, little. "dance little baby, dance up high. Never mind baby, mother is by. Crow and caper, caper and crow. There little baby, there you go. Backwards and forwards, up and down..."
Sigh, makes me want another little one, 5 wouldn't be so many would it? The twins are almost three and I am already missing the teeny-tiny stages. I like how subtle you are. and I like a girl who knows how to get what she wants. men need direction, dont they? cant wait to see it in your home on Mothers Day. jeff *definitely* has great taste in art & gifts ;) hee hee! what a sweet print! the perfect gift for mother's day!! Does Jeff read the comments? A lot of people have said this post would be too subtle for their husbands. So incase Jeff falls into this category, Jeff, she (who is carrying your child) wants you to buy this for her. For mother's day. Or because she will soon give birth. Or even because you love her. Happy to help Anna Maria! Very nice. Subtle. I emailed my husband a link to a magazine I really wanted for Christmas, and guess what? I got it! I was delighted. Good luck. Haha! that's so fantastic! I can completely relate right now :) Sometimes those sweet husbands just need a little nudge :) or a few ideas! I love the eight little birds in the sky, just like ya'll...how could he not get this for you? I want my husband to get me an OTT light. HMMMM...how can I hint at that? This made me smile - I love a girl who knows what she wants!! What a lovely print. LoL! I cn see why you would lie that picture so much-hope you get it! It was so crazy to see this on your blog there is a pizzeria down the street from my house that has a bunch of originals of his on the walls. I love his stuff. I hope your husband takes Hint. I went in to labour the day after Mother's Day last year. I don't think my hubby even made the connection. Good evening. You are super cute. What a gorgeous painting. I'm feeling positive vibes that Jeff will pull through for you on this one :) You certainly deserve it you brave wonderful soul. I so admire your commitment to both family and to the arts that you love so much. Thanks for making life more beautiful. Will you be in Pittsburgh for Market or is the blessed babe due at the same time? Hi Anna, hope your gentle hints work for you. For years I have said to my husband, you know if you were to send me flowers, that beautiful flower shop up the road is where I would like them from. Well yesterday it was our 15th wedding anniversary and to my utter surprise, a knock at the door and the most amazing bouquet of flowers I have ever seen!! So I hope your gentle direction bears fruit, and that it doesn't take 15 years! I love that print, it's so pretty. Hope your little hint works... he he. Oh... I hope Jeff catches on quicker than my husband did. "Oh... did you want a new camera?" oh man, i love brian kershisnik. i hope you get the print. Yesteday, I took yellow and blue markers and drew a big swirly box around May 10th! My birthday is May 9, and some years actually falls on Mother's Day, which I've always thought was a bummer, although maybe not for my mama, since in 1975, May 9th was Mother's Day! First of all I love your blog and your work is amazing. Imagine my delight to see the Brian Kershinik print make an appearance. I work for Artful Home. His work is amazing! Did you see that we are selling some of the pieces we had framed for our catalog photo shoots? 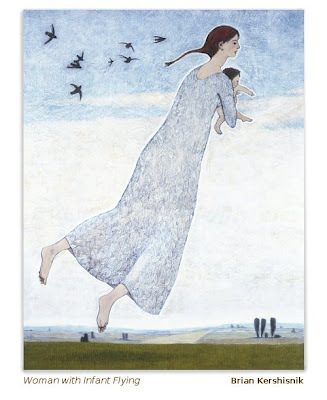 "Woman with Infant Flying" isn't one of them, but some of his other work is available.